Manipur agriculture, veterinary and animal husbandry, minister, V Hangkhanlian on Tuesday said coordination efforts of various line departments are essential in order to achieve self-sufficiency in food grain productions. Minister Hangkhanlian said the food grain productions of Manipur are 493.37 thousand tones whereas the requirement is 608.50 thousand tones having a shortfall of 115.15 thousand tones for the State. 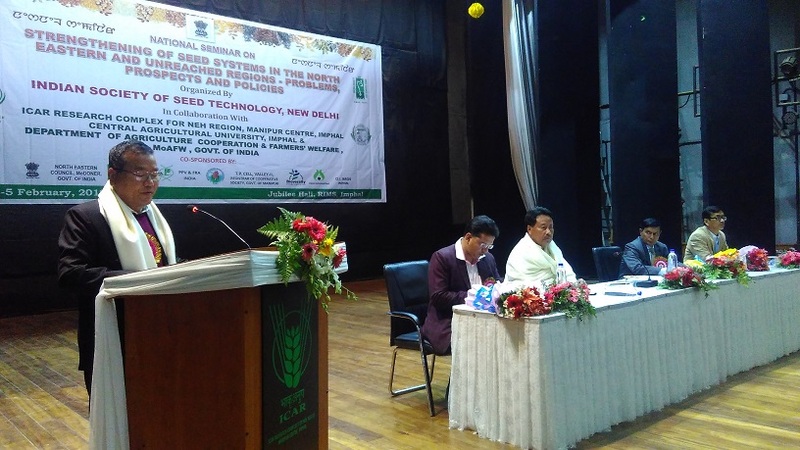 Hangkhanlian was attending the valedictory programme of the first ever three-day national Seminar on ‘Strengthening of seed system in the North Eastern and unreached regions – problems, prospects and policies’ which concluded at RIMS in Imphal. He further emphasized that cropping intensity of the State is 151.9 per cent, so assured irrigation, selective mechanization, gracious use of plants nutrients, relay cropping should be implemented to meet the increasing demand of the people. A set of concrete and workable recommendations that will be suitable for the north-eastern region will come out from this three days seminar, he urged. Mentioning the various programmes formulated and implemented by ministry of agriculture and farmers` welfare under the leadership of Prime Minister Narendra Modi, the minister highlighted the programmes like Soil Health Card Schem (SHC), Paramparagat Krishi Vikas Yojana (PKYV), Mission Organic Value Chain Development for North Eastern Region (MOVCDNER), Small Farmers Agri. Business Consortium (SFAC), Pradhan Mantri Fasal Bima Yojana (PMFBY), Pradhan Mantri Krishi Sinchayee Yojana (PMKSY), National Food Security Mission (NFSM), Rashtriya Krishi Vikas Yojana (RKVY). As per guidelines of Prime Minister ‘Doubling of Farmers’ Income by 2022,’ the schemes are implementing in this regard and strategies for Manipur were prepared by experts from different stakeholders including ICAR,CAU and state departments, he asserted. During the occasion, several resource persons also presented valuable inputs and suggestions for the improvement of seeds and agricultural products in the region. Ch Amir Singh Memorial Lifetimes Achievement Award, Scientist of Eminence, Young Scientist Award for 2017, & 2018, ISST Fellows, ISST Best Research Paper for the Year 2017 and others awards were handover to the awardees by the dignitaries in the dias. The seminar was inaugurated by the deputy chief minister Y Joykumar Singh on Sunday.